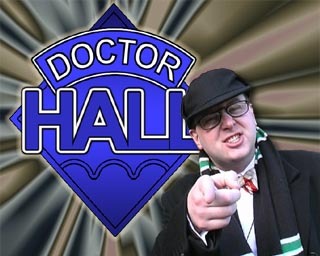 "Dr Hall" is our spoof of Doctor Who. 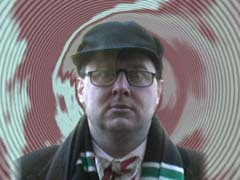 It features Mark Stalker in the lead role as a deluded Michael Caine impersonator who believes he can travel through time and space in his wheely bin. We approached the making of this project in a different way to previous Foiled Productions films. There were no scripts and no rehearsals - we just came up with an idea for an episode, got together and filmed what happened. Of course, to get the necessary coverage to do a good job of the editing, it meant we had to repeat the entire thing several times from different angles - a tricky task when it was mostly made up on the spot. With some of the later episodes the lead actor, Mark, prepared a rough script a day or two in advance based on the idea of the episode, for his dialogue at least. Although this helped with the planning of the episodes it still left space for us to add improvisations on the day. There are currently eight episodes of Dr Hall. The opening titles feature our own very distinctive version of the famous theme tune. Appearing on vocals are Stephen Davis, Erik Dege, Arron Edwards, Shaun Gostelow and Ian Lindsay. The titles are not currently available as a separate download, but can be seen at the start of Episode One in their entirety, and at the start of all episodes from Episode Four onwards in an abbreviated "15 second" format. This is a list of the episodes that we've made so far. Click on an episode title to be taken to a page about that episode and to watch it. There is an ongoing story "arc" so it's best to watch them in order - and avoid looking ahead if you don't want to know what happens in advance! 6. 2m4s Death To The Cidermen!